The FIX IT team is very excited to be participating in the Autonomous Race Car Competition in Cambridge, Massachusetts this summer. For students in the United States, they will be participating in the Beaverworks summer program. FIX IT will be the only team from Canada at the event! The FIX IT Race Car team members (Ethan, Tianne, Emily and Ines) will be working alongside the Beaverworks students for the week before the competition. We’re all looking forward to meeting them and working together to get the race cars ready for the competition on August 5, 2018. FIX IT team members Emily and Ines have been working with Don to assemble our race car at Makerspace in Victoria. We still need a few more cables, but it’s almost done! Thanks to Rainhouse for making some specialized parts needed to assemble the race car! 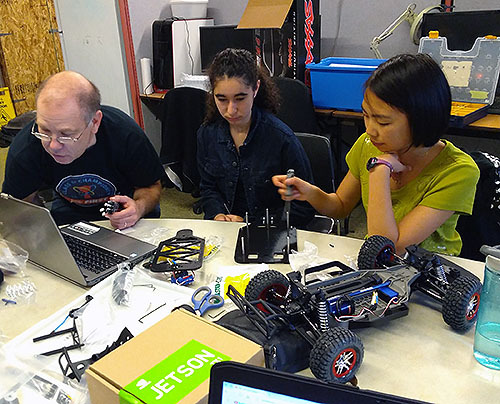 The whole team has been working through online courses to learn python, OpenCV, and ROS for programming the Race Car. Most of the testing will be done using the Gazebo Simulator which is amazing. It is a 3D virtual environment where users can rapidly test their software programs to control the car on a race course. 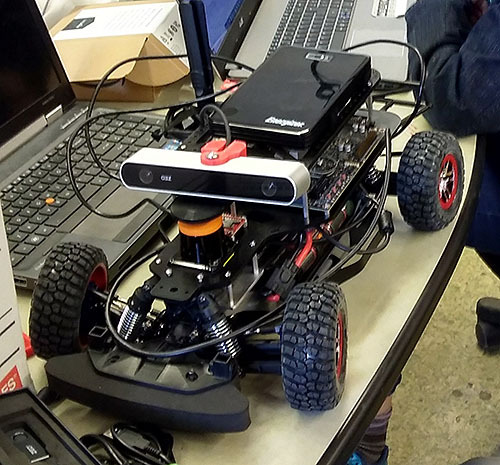 This approach works great since the students won’t need to have the race car to be able to test their programming!